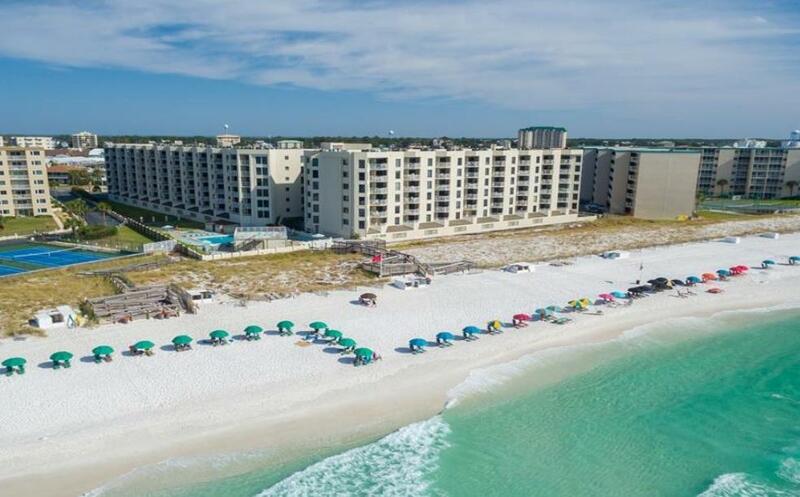 Inlet Reef Club is a luxury beachfront condominium building on the Holiday Isle peninsula of Destin, with covered parking and with a large 2-bedroom floorplan of 1360 sq.ft. Unit 517 is in the west-side gulfview wing of the building. Inlet Reef Club is a popular vacation-rental building. This 6th-floor condo is beautifully and tastefully remodeled and updated in kitchen and baths and appliances and with tile flooring throughout. Look to see how you might choose to create a small 3rd sleeping space at the back of the kitchen. Large hex-shape balcony. Inlet Reef is an Owner Pets Allowed building.